It’s no secret I love Cube, but I definitely love it more when I’m winning, and I did a bit of that this week. Cube leaves MTGO next Friday, which makes me sad, even if Masters 25 looks like it’ll be a fun format. Horseshoe Crab + Heavy Arbalest is a cute combo, but it’s no Pestermite + Splinter Twin. Sorry about the weird organization here. I didn’t take a screenshot until the league was over, and, MTGO being a quality program, I couldn’t move any of the cards around. I love this style of deck in Cube because you have the crazy combo potential of early Ulamogs, but you can also play a grindier game and actually cast a lot of your threats. I actually find the premium reanimation targets to be Titans, Myr Battlesphere, Massacre Wurm, and Griselbrand. With the exception of Griselbrand, they are all quite castable if you have other ways to draw out the game. I like to have the “fair” options because, if you devote a bunch of resources to making an early Ulamog, the Ceaseless Hunger, for example, and your opponent can untap and cast Swords to Plowshares or Journey to Nowhere on it, you’ve exhausted a significant amount of your combo potential. If you don’t have any easily castable threats, you now have to assemble both 1) A reanimation threat, 2) A discard outlet, and 3) a way to reanimate it. You’ve already gone through a couple of those things, and you don’t have tons of time to assemble that contraption a second time. If you can just cast a Grave Titan on 6 mana, you might be able to win that way, but if you’re leaning on Terastodon, you’re out of luck. Griselbrand is the exception to the rule because he provides so much card advantage that you can easily re-assemble the reanimation combo, even if he dies immediately. Some notable emissions from the main deck here are Volrath’s Stronghold (I want my things in the ‘yard), Lightning Greaves (I don’t want do-nothing cards if I can’t find my combo), and Whip of Erebos. For Whip, I like to have a few more value targets like Baleful Strix or Gonti, Lord of Luxury. Having to invest 8 mana into reanimating the first creature is a little steep, and I’m already trying to play a bit more of a controlling game, where I might not be able to afford to do nothing on 4. Round 1, I ran into the buzzsaw that was Geist of Saint Traft. I didn’t have any good answers to that card, and I lost both games where my opponent played it on turn 3, though I won the middle game. Round 2, I ran into someone who must have been fairly inexperienced at Cube, playing a BG midrange deck. Game 1, I got stuck on 2 lands and eventually discarded Myr Battlesphere. My opponent played Scavenging Ooze and…exiled my other two cards. I introduced them to the wonders of Cube by Exhuming the BattleBall. Game 2 was painful as I had a hand of double Looter and Vendilion Clique. My opponent had Liliana, the Last Hope on turn 3 on the play, which just proved too much for my hand full of X/1s. 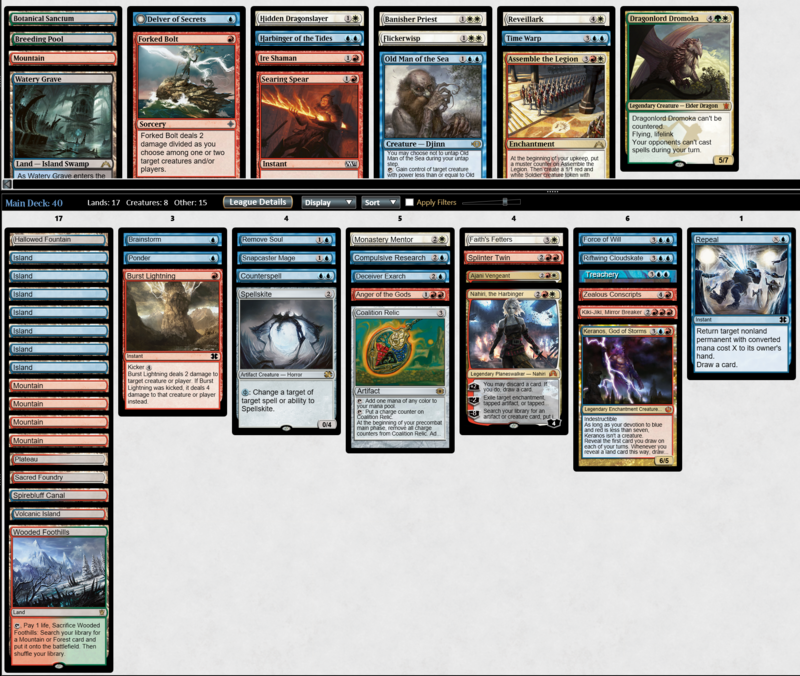 Game 3, they again had Liliana to trump my Merfolk Looter, but I had a follow-up of Jace, the Mind Sculptor. They had Maelstrom Pulse for that, and I was stuck doing nothing. They followed up with Pernicious Deed and Scavenging Ooze, and things looked pretty dire for me. I was able to Frost Titan to keep them from doing too much, and I used Vendilion Clique as a Lava Spike to keep Lili from ultimating. My opponent then had Thragtusk and Nissa, Voice of Zendikar, ticking Lili up to 7, and I was already resigning myself to the 0-2. 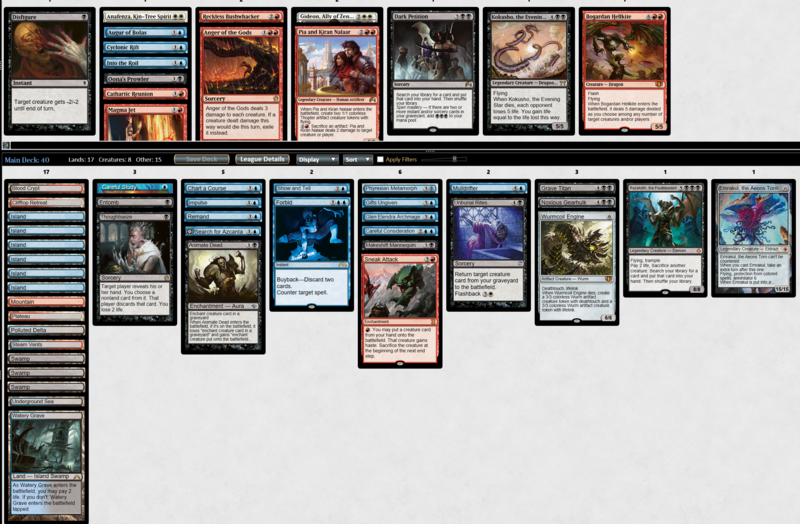 Then I topdecked Cyclonic Rift with 7 lands in play. Big Frosty locked down one of their lands, and they couldn’t recover. Phew. They were also at 2:20 on the clock when I cast the Rift, so I maybe could have timed them out before I died, since I was holding Crux of Fateand Snapcaster Mage to flash it back and buy a few turns. The Nissa ultimate would have killed me in short order, though. Timing out isn’t really how I want to win, anyway. Now, if you’ve never seen Manaless Dredge do its thing in Legacy, you might not register this play, as it’s completely unintuitive to “normal Magic.” But Cube ain’t normal Magic. My opponent opened on a tapped Blood Crypt, so what did I do? I passed my turn without even playing a land, went to my cleanup step, and discarded the BattleBall because I now had 8 cards in hand. Black-Red doesn’t have too many good answers to Myr Battlesphere. On my second turn, I played my Swamp and Reanimated the BattleBall. My opponent’s turn 3 play? Liliana of the Veil. Which, if you were wondering, does not match up well against a Battlesphere and friends. Game 2, my opponent once again had Liliana on 3. This time, they were kind enough to plus her, and I was able to plunk Frost Titan into the ‘yard, with Exhume in hand. I flashed in a Nimble Obstructionist to protect my incoming Titan, as well as pressure the Lili. They actually fought back quite well, landing an Opihiomancer and Inquisition of Kozilek-ing away my Exhume. I hit Ophiomancer with a Control Magic and began pressuring Lili with the snake token, but they found Anguished Unmaking for the Control Magic, and stripped both of our hands down with Liliana. I found a Looter il-Kor, though, which not only kept Liliana from ticking up too high, but also gave me the option to hit the opponent to loot away any bad topdecks. Eventually I found Animate Dead for Frost Titan, and they no longer had enough resources to deal with it. Hoo boy, this is my favorite cube deck I’ve drafted in a long time. 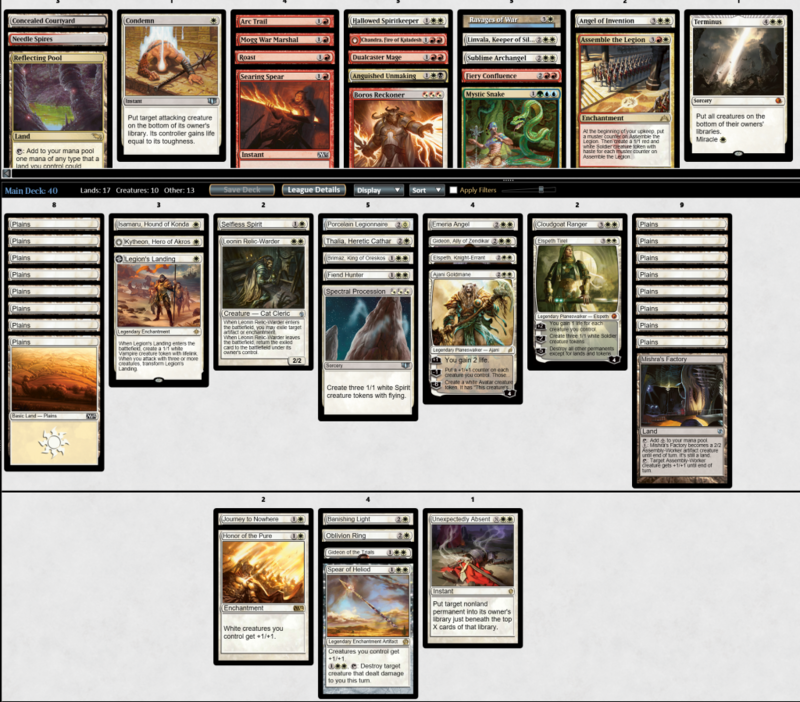 This was the easiest 3-0 I’ve ever had, I think. Game 1 of the first round set the tone, as I was able to curve turn 2 Thoughtseize into turn 3 Show and Tell for Emrakul, the Aeons Torn. My opponent was some GW midrange creature deck and never stood a chance. I boarded in some cheap burn spells for Lotus Cobra and friends, and sneaked some Wurmcoil Engines and Noxious Gearhulks and Bogardan Hellkites in until they conceded. Round 2, I played against a player named Limited_Agent. I name them because they tried to scum me out of the round, and I have no tolerance for people like that. If you ever have someone try to do this to you, please report them. 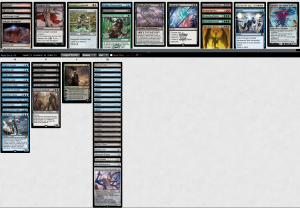 I won a long game 1 against Esper control on the back of a turn-2 Search for Azcanta just out-valuing them. Game 2, I remanded their turn-3 Jace Beleren, following up with Search + Thoughtseize on my own turn 3. Thoughtseize saw nothing that could stop the Sneaking, and I put an Emrakul into play with them on exactly six permanents. Then they went AFK, with 16 minutes on the clock. Okay, some people disconnect sometimes, but not only did they force me to wait for the 10-minute inactivity timeout on MTGO, they came back just after their clock went under 10 minutes, passed priority once, and then went away again. This forced me to wait for another 10 minutes instead of 4. They came back one more time at 2 minutes remaining, passed one more time, and then let the time run out with Emrakul’s trigger on the stack. No doubt they came back each time hoping that I had walked away, thinking I would win by default. Then they could pass priority to me and let my 10-minute timeout happen to score a free win. The fact that they came back every so often to pass one single step is the scummiest thing I’ve ever seen on MTGO. Report people like this, please. Round 3, I played against another ramp-ish deck. I had Forbid with Buyback to counter their 3 payoff spells, and a Grave Titan to close the game. Game 2 got a little dicey, as I kept a speculative hand that basically had no choice but to run a naked Show and Tell for Bogardan Hellkite to clear a Ral Zarek to which I otherwise had no answer. They put down a Keranos, God of Storms off the S&T, but that could not answer Hellkite, and I followed up with Phyrexian Metamorph on the Hellkite to close out the 3-0, 6-0. I opened a very weak pack in this draft and took Gideon, Ally of Zendikar. I followed up with Batterskull, hoping to pick up a Stoneforge Mystic along the way. Now, those two cards don’t necessarily lock you into White Weenie, but they are a very solid start. A few anthems and an Armageddon later, and there I was. This isn’t my favorite archetype to play, but it is a strong one, usually good enough for a 2-1, which is indeed where I ended up. The Ajani Vengeant splash was basically free with a pair of fetches and a Plateau, and I needed a little more oomph on the top-end. Missing on Stoneforge and Thalia, Guardian of Thraben really hurt, but I cobbled together some more mediocre 2-drops. Round 1, I played against a green ramp deck that was mostly ramping with things that put lands into play, and not creatures. I Armageddoned them right out of existence in game 1. Game 2, they kept a one-land hand with Avacyn’s Pilgrim and a Fauna Shaman to fetch more mana dorks. Problem was, I kept a Wasteland, and their land was an Overgrown Tomb, not a Forest. Avacyn’s Pilgrim tried really hard, but could not make green mana, and I was soon off to round 2. Round 2, I lost to a monored deck that had Outpost Siege on turn 4 both games. I feel White Weenie is favored in a straight-up aggro mirror, but the Outpost Siege just generated too much value for me to overcome, and I never drew my Batterskull. Round 3, I played against a blue-black player who made some…questionable deckbuilding decisions. They were able to take game 1 when I mulliganed and couldn’t find any way to exile a Phyrexian Obliterator. Which, I don’t really know why they were playing that, being that they didn’t ever show me any UB duals, and they were also running Rishadan Port. I got my justice in games 2 and 3, where they drew lots of Islands and Port and played Bloodghast and Thassa, God of the Sea, which are, shall we say, not too good against little white idiots. Maybe they misread Bloodghast and thought it could block. I once again opened on Gideon, Ally of Zendikar. This time, however, I saw plenty of 4- and 5-mana monowhite payoffs, but very slim pickings at 1 and 2. I wasn’t thrilled about that, but it turns out that Spectral Procession, Brimaz, King of Oreskos, and Cloudgoat Ranger still combine really well with Honor of the Pure et al. Who knew? Round 2 went much better, as I faced an opponent who mulled to 5 in game 1, then led on Gaea’s Cradle as their opening land. Yikes. Game 2 had a little more play to it. They brick walled me with a Linvala, the Preserver, but I had a Linvala of my own, in the form of Linvala, Keeper of Silence, that shut off their mana dorks. I was eventually able to hit their Linvala with an Unexpectedly Absent and fly over for the W.
Round 3, I got to capitalize on a pretty big blunder from my monoblack opponent. Cube has a lot of strange interactions, and it’s hard to keep track of everything. I stumbled on lands for a turn or two, wherein my opponent was able to land a Gatekeeper of Malakir to kill my Isamaru, Hound of Konda. Eventually I was able to stick Thalia, Heretic Cathar. My opponent played Gonti, Lord of Luxury and passed. I attacked with Thalia, intending to follow up with a Brimaz. They chumped with the Gatekeeper, which was surprising. I ran the numbers and figured they probably had Volrath’s Stronghold or some other way to get the Gatekeeper back to their hand. So, my opponent played Emeria Angel, which Gonti stole from me, and made a bird by playing the Stronghold I’d suspected. I untapped and played Fiend Hunter on Emeria Angel, which basically locked out the Gatekeeper of Malakir play they had planned to make. Sorin Markov came down and picked off Thalia, but I had Banishing Light to answer that. Then, on their upkeep, they made the Gatekeeper play anyway, which not only gave me an Emeria Angel when I sacrificed Fiend Hunter, but also ate their draw step for the turn. I think they had it in their head that they would get the Angel back if I sacrificed the Fiend Hunter, but it returns under the owner’s control. So their plan was to kill Brimaz with the Gatekeeper, but I wound up running away with the game thanks to the Angel. Game 2, I kept 4 plains, Isamaru, Journey to Nowhere, and Brimaz. Then proceeded to draw nothing but lands and a single Spectral Procession, which turns out is not very good against Liliana, the Last Hope. Game 3, I just curved out neatly, Thalia into planeswalkers with removal to back them up. Another 2-1, but a fairly boring one. White Weenie is a fine deck, and certainly powerful enough to be worth playing if you care about winning, but I play Cube to make sweet plays that you can’t make anywhere else, and WW doesn’t give you as much leverage in that department as I’d like. This was another really fun deck to play. For the third draft in a row, I opened Gideon, Ally of Zendikar, but this time there was a Snapcaster Mage in the pack. I decided to cast off the yoke of fair white decks and return to some good, clean, unfair Magic. This is another deck that shows off the importance of good mana in Cube. I rattled off another 3-0 (6-0 in games) on the back of my fantastic mana. I was able to play Counterspell, Kiki-Jiki, and white cards all in the same deck with no issues. I took all of the lands except Spirebluff Canal very highly, and I still wound up with enough playable cards to cut several. Round 1, I faced White Weenie and had kind of an awkward hand. I was forced to try and combo off before I could replay my Spellskite that had been bounced by Unexpectedly Absent, on account of a Thalia, Guardian of Thraben that made my Splinter Twin cost 5. My opponent had 2 mana open, which represented Path to Exile or Swords to Plowshares, and they had 3 cards in hand, but I was dead if I didn’t win that turn, so I went for it, and they didn’t have it. Game 2, my opponent curved out with Mother of Runes into Thalia into Mirror Entity. However, they took the aggressive line of tapping 3 mana into the Mirror Entity on turn 4, meaning I was able to Searing Spear the Mom on their end step, then untap and cast Anger of the Gods to sweep up those three creatures, plus the follow-up Isamaru. They tried to recover with an Angel of Invention, but I had a Riftwing coming off suspend to eat one token, and then drew into Old Man of the Sea, which was able to steal the Angel and get the scoop. 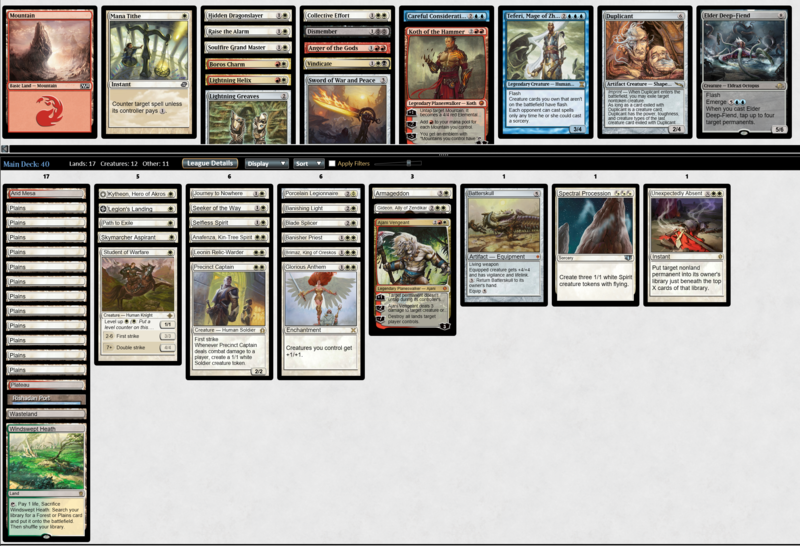 Round 2, I played against some kind of blue-white Midrange deck. They tapped for 2 threats, I had 2 counterspells, and then I landed a Keranos. I then assembled the brutal combo of Kiki-Jiki + Riftwing Cloudskate to keep them off doing anything else. Game 2, my opponent made a…strange…play. I had suspended Riftwing on 2. They did nothing for a few turns, then played Secure the Wastes for 3 on my end step. They knew I had a Riftwing coming in, but they Armageddoned anyway. Perhaps they wanted to feed me a spell to counter? I didn’t happen to have a counterspell, but I don’t think I would have played it, even if I had one. I was holding 2 Islands, and my Riftwing was going to kill a token and block the others. They didn’t even have a land to follow up the Geddon. Eventually they hit one…and then cast Path to Exile on my Riftwing, giving me free access to a Mountain. Not a play I would have made! It let me land Keranos and have Treachery if anything ever happened. This was a hell of a week for me. Three trophies in just nine drafts is a good place to be. I don’t expect to keep up this pace, but I’m about 60 play points up from where I started, and any time you’re positive on MTGO, it’s a lot more fun! I didn’t play a single green card this week. I think green is very overdrafted, and for good reason. There aren’t many sources of fast mana outside of green in Legacy Cube, as opposed to Vintage Cube, where you get things like Sol Ring, Mana Vault, Moxen, Signets, etc. in all colors. Green in Legacy Cube is almost a combo deck, where you have to assemble both a critical mass of mana ramp effects and a critical mass of big payoff spells. I tend to avoid it unless I get one of the more powerful cards, or I get some sign that it’s very open, like a sixth-pick one-drop mana accelerant. I don’t like to force green ramp in Legacy Cube by taking an early mana dork, unless that mana dork is something like Rofellos, Llanowar Emissary. In Vintage Cube, you can force green if you want it, because people will be busy taking non-green ramp effects. In Legacy Cube, your mana accelerants often get poached by fair midrange decks that will happily play a random Lotus Cobra or Cultivate in order to cast their planeswalkers a turn or two sooner. In Vintage Cube there are both fewer midrange decks that would want such an effect and also more colorless fast mana for those that do.